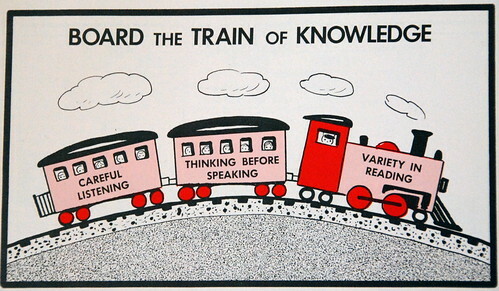 Don’t let the train of knowledge pull away without getting on board. I publish this in reference to a knot of recent conversation reflecting on the habits of the Leaderboard types in the technology writing community. I say “writing” not “blogging” because really it doesn’t matter that their chosen medium is blogs. It’s not about the tools, it’s about use of the tools. Josh, Josh, Jake, and Steve all shared thoughts recently about their growing irritation with the behavior patterns of a small subset of technology bloggers. Josh Kleinpeter and Steve Rubel point to the redundancy and misplaced focus of those who are sometimes referred to as the “A-List”, Josh Hallett realized he doesn’t really need to be reading many of those people any more, and Jake described what his recent interactions with a few famous names were like. Along these same lines, things got so contentious recently that Brian Oberkirch felt the need to invoke the nuclear option Brother Senor Love Daddy to get everyone to cool out. Ethan Kaplan called out the ridiculous amount of attention paid to Robert Scoble’s carefully orchestrated Facebook/Plaxo standoff at the expense of any number of interesting and important things worth writing about. None of these dustups are new, but you’d think we could get a little better at this over time. As Josh described, an easy remedy on the individual level is just to stop reading the people you feel you “need to” and the aggregators that only aggregate the news those people glom on to en masse. I’ve been unfollowing more and more people in Twitter and removing some of the feeds from my RSS reader that I once thought were essentials. But as a remedy to those seemingly caught in or addicted to bad writing and publishing patterns, I wanted to offer the vintage advice above. No matter what your chosen medium happens to be, slow down. Listen with both ears and an open head. Think before you write/speak/comment. Read widely. Great graphic! It’s funny how the ‘new’ problems aren’t really that new.